The San Antonio Spurs have more injury concerns with a little more than a week remaining until the regular season. 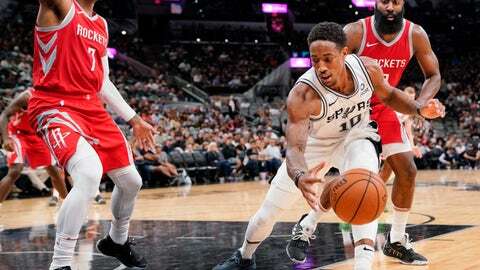 Starting point guard Dejounte Murray’s knee buckled and he crashed to the court Sunday in a preseason loss to the Houston Rockets. He will undergo an MRI exam on Monday. Murray was driving to the basket against Rockets guard James Harden on a fast break when his knee gave. The third-year player remained on the court for several minutes writhing in pain. Spurs officials brought out a wheelchair to take him off the court, but Murray refused, rising to his feet amid a raucous cheer from the San Antonio fans. Murray tested his knee in front of the Spurs’ bench before heading to the locker room with team officials. It was the second injury in the last two games for the Spurs, who lost rookie Lonnie Walker IV to torn cartilage in his right knee and will miss at least six weeks. Coach Gregg Popovich didn’t have an update on Murray, who took over the starting point guard job from Tony Parker last season. On the other side, the Rockets are getting healthier. P.J. Tucker started at forward after missing the first two games with a sore back and had 19 points and seven rebounds. That moved Carmelo Anthony to a reserve role, and he responded with 12 points and six boards. Harden scored 21 points to lead seven Rockets in double figures. He also had nine assists, as did Chris Paul. DeMar DeRozan scored 22 points for the Spurs. ROCKETS: Paul had 11 points and eight rebounds, though shot only 4 for 13. … Gerald Green scored 13 points. … The Rockets were 17 for 53 on 3-pointers. SPURS: Rudy Gay scored 13 points on 6-for-7 shooting. … LaMarcus Aldridge was only 5 for 15 for 10 points, adding seven rebounds. … San Antonio was 4 for 21 (19 percent) from behind the arc. UP NEXT: Houston (2-1) hosts the Shanghai Sharks on Tuesday. … San Antonio (2-1) visits Atlanta on Wednesday. Dennis Schroder had 20 points, seven rebounds and six assists against his former team in Tulsa to spoil Atlanta rookie Trae Young’s return to Oklahoma. Paul George scored 16 of his 22 points in the third quarter for Oklahoma City. Schroder was the Hawks‘ starting point guard last season before going to Oklahoma City in the three-way trade headlined by Carmelo Anthony. Starting in place of Russell Westbrook on Sunday, he was 9 for 14 from the field. The Thunder outscored the Hawks by 30 points while he was in the game. Young, the University of Oklahoma star, was 5-of-13 shooting for 16 points. HAWKS: Center Alex Len scored a team-high 18 points, but the Hawks shot just 38 percent from the field. THUNDER: George made 9 of 10 free throws as the Thunder went 28 of 36. … The Thunder outscored the Hawks 35-16 in the third quarter, making 10 of 23 shots. Atlanta was 4-of-19 shooting in the frame. UP NEXT: Atlanta (1-2) hosts San Antonio on Wednesday. Oklahoma City (2-1) stays home to play Milwaukee in its final preseason game. Giannis Antetokounmpo had 15 of his 21 points in the second half and finished with nine rebounds to help the Bucks beat the Timberwolves at Hilton Coliseum in Ames, Iowa. Milwaukee built a 10-point lead at the end of the first quarter and led by at least five the rest of the way. Karl-Anthony Towns had 33 points and 12 rebounds in the first three quarters for Minnesota before sitting out the fourth. BUCKS: First-round pick Donte DiVincenzo scored 12 on 5-of-12 shooting. … Christian Wood had 14 points and seven rebounds and Khris Middleton added 13 points. … John Henson had nine points in 14 minutes but fouled out. TIMBERWOLVES: Gorgui Dieng had 13 points and eight rebounds. … Derrick Rose was given the night off for rest. … Jimmy Butler has not played in any of Minnesota’s four preseason games. UP NEXT: The Bucks (2-0) visit Oklahoma City on Tuesday. The Timberwolves (1-3) travel to Milwaukee for a rematch with the Bucks on Friday. Donovan Mitchell scored 21 and Utah rallied with 19 straight points to take the lead late in the fourth quarter. Damian Lillard scored 23 and CJ McCollum added 21 for Portland. Jusuf Nurkic had a double-double in the first half and finished with 20 points, 11 rebounds and five blocks. JAZZ: Mitchell rolled his ankle and left the game late in the third quarter, but the injury did not appear to be serious. … Joe Ingles had 12 points, seven rebounds and five assists. … First-round pick Grayson Allen made 1 of 2 3-point attempts and is 11 of 21 from 3-point range in the preseason. TRAIL BLAZERS: First-round pick Anfernee Simons scored 10. … Maurice Harkless went through a full pre-game workout but missed the game (right ankle). He also sat out the first two preseason games with a left knee issue. … Evan Turner (shoulder) did not play. UP NEXT: The Jazz (4-0) visit Sacramento on Thursday. The Trail Blazers (1-2) host Phoenix on Wednesday.